As previously undeveloped land is paved over and built upon, the amount of stormwater running off roofs, streets, and other impervious surfaces into nearby waterways increases. The increased volume of stormwater runoff and the pollutants carried within it degrade the quality of local and regional water bodies. As development continues, the watershed’s ability to maintain a natural water balance is lost to a changing landscape and new impervious surfaces. This problem is compounded by impacts of climate change on our stormwater systems. A while back, I ran across a listing for a World Workplace workshop from the International Facility Management Association (IFMA) on stormwater management techniques, and I discovered that Jay Drew, the Facilities Project Manager at the Connecticut General Assembly and a national leader on stormwater management, sat on IFMA’s International Sustainability Committee and had done some amazing work at Connecticut’s state Capitol. We reached out to Jay to see if we could get a tour and he enthusiastically replied, letting us know that the one of the goals of the work was to inspire others. As we arrived at the Capitol, the beauty of its plants first caught my eye. I was amazed to learn that these plantings were also an integral piece of the stormwater management program. The rainwater garden pictured above is actually a natural filtration system. Rainwater is channeled from the Capitol’s parking lot into a “rain garden,” whose plants are selected for their ability to pull toxins out of the water. 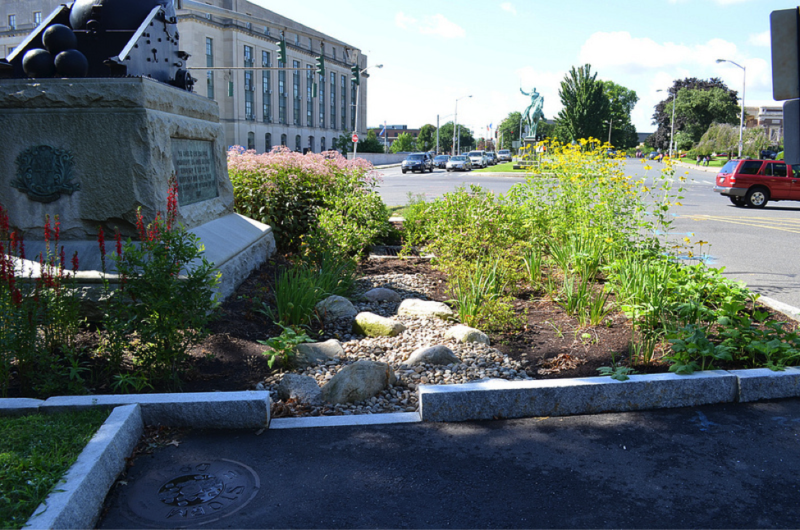 The Capitol’s rain gardens purify some of the stormwater that falls on its parking lot, but almost half of the Capitol lot has no need for this because its asphalt has been replaced by pervious pavement. Similar in look to traditional asphalt, it can absorb five gallons of water a minute. Drew told us that it works so well, they were able remove snow and ice by flooding the parking lot its first winter. Although pervious pavement and rain gardens can help mitigate stormwater runoff in parking lots, garages call for different strategies. To capture rain falling on the Capitol roof, Drew installed a rainwater harvesting system. Carried by a traditional gutter system into an untraditional below-ground 8,200-gallon cistern, the water is slowly released to hydrate the flowers that caught my eye. This approach, perfect for the top deck of parking structures, both lowers the stresses on the city’s sewer infrastructure and reduces its demand for potable water. 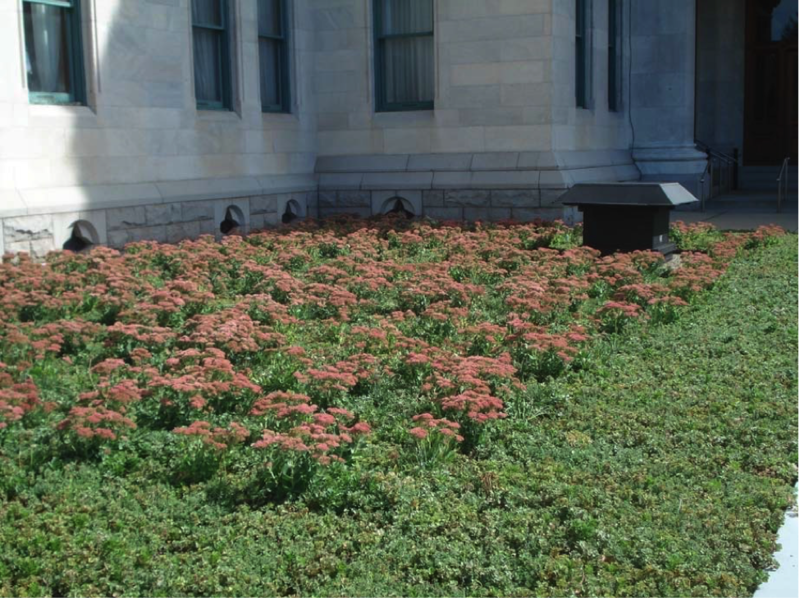 Around the corner, a small patch of wildflowers (pictured below), turned out to be part of a vegetative or green roof built atop the Capitol’s underground boiler system. Green roofs have been installed on numerous parking decks; in some cases, as athletic fields. This trip to the Capitol was truly enlightening. As an individual focused on green and smarter parking, I understand that the negative impact of parking on stormwater runoff has become so great that places such as Philadelphia are assessing taxes to help offset the cost of its effect. What this tour demonstrated to me is the residual benefits of integrating stormwater management techniques. While lowering your impact on city infrastructure, you can also beautify your property, lower your demand for potable water and eliminate the need for additional drainage systems in new construction situations—not to mention further prepare your facilities for Parksmart certification. When looking to make the next capital improvement to one of your facilities, Parksmart is here to help. Parksmart is the world’s only certification program that defines, measures and recognizes high-performing, sustainable garages. To learn more about how you can beautify your property and better integrate it into the natural environment, please contact us.